Located in Doylestown, Pennsylvania, the Mercer Museum preserves the historical collections of archaeologist Henry Chapman Mercer, showcasing a variety of pre-industrial tools and technologies common to American life prior to the 20th century. Born on June 24, 1856 in Doylestown, Pennsylvania, Henry Chapman Mercer developed an interest in historical preservation and archaeological collection from a young age, serving as a founding member of the Bucks County Historical Society after beginning law school at the University of Pennsylvania. In the early 1890s, Mercer became the Curator of American and Prehistoric Archaeology at the University of Pennsylvania Museum and soon thereafter began cultivating an extensive collection of pre-industrial American artifacts, wishing to preserve the technologies and tools common to American life prior to the Industrial Revolution. Throughout his career, Mercer became known as a noted expert on ancient toolmaking and ceramics, founding Moravian Pottery and Tile Works in 1898, which supplied the tiles for the floor of Harrisburg’s Pennsylvania State Capitol Building. He also constructed three unique structures throughout his life, including the Moravian Pottery and Tile Works facility, his Fonthill Castle residence, and what would become the Mercer Museum building, completed in 1916. Following his death in 1930, the three buildings, commonly referred to as the “Mercer Mile,” were acquired by the Bucks County Historical Society. In 1972, the museum building was added to the National Register of Historic Places, and in 1985, the three Mercer Mile buildings were incorporated into a National Historic Landmark District. In June of 2011, a major expansion was added to the museum, featuring a new visitor center and expanded exhibit space. Today, the Mercer Museum displays more than 40,000 American artifacts created prior to the 20th century, most from Mercer’s original collection of pre-industrial tools and artifacts. As an American Alliance of Museums-accredited facility, the museum is visited by more than 65,000 annual visitors. The nonprofit museum is operated by the Bucks County Historical Society and supported by a number of regional and national organizations, including the Pennsylvania Council on the Arts, the Pew Charitable Trusts, and the Pennsylvania Historical and Museum Commission. It is credited as a major inspiration for the Henry Ford Museum in Dearborn, Michigan and was noted to have been considered by Ford to be the preeminent museum in the United States in the early 20th century. More than 55 exhibit rooms are showcased throughout the museum, highlighting artifacts of tools and technologies commonly used in American everyday life throughout the 18th and 19th centuries. Visitors may explore the museum’s seven floors of exhibits at their leisure with the assistance of an audio exhibit tour, available for checkout at the museum’s reception desk. Permanent exhibit rooms focus on the tools and technologies of individual pre-industrial crafts and trades, including items related to food preservation and harvesting technologies, stoneworking, glassblowing, pottery making, clothing production and shoemaking, tinsmithing, gunsmithing and weapon-making, and other industrial and home technologies. Large artifacts are also showcased within the museum’s halls, including an authentic Conestoga wagon, a whaling boat, a cider press, and an antique fire truck. In addition to permanent exhibits, a number of temporary rotating exhibits showcase artifacts and topics related to aspects of American history and culture. The museum’s third floor also features the Bucks County Historical Society’s Spruance Library, which contains an extensive volume collection of historical materials and allows visitors to research their family history through a collection of archival records held within the area’s County Archives. Two family galleries, the Children’s Gallery and the Imagination Gallery, are located on the museum’s fifth and sixth floors, allowing young visitors to explore the museum’s collections with their families in a safe, hands-on environment. Group tours of the Mercer Museum are available for small groups and organizations, featuring a 15-minute orientation lecture by museum docents. Field trip opportunities are also provided for elementary and secondary school students, incorporating Pennsylvania curriculum elements. A traveling trunk program is also available for students in grades 1-9, bringing museum materials and staff directly into the classroom. Themed in-class programs and school assembly programs are also available, focusing on a variety of topics related to pre-industrial American history and culture. Programming is also available for scouting groups, including badge-focused workshops and overnight museum experiences. 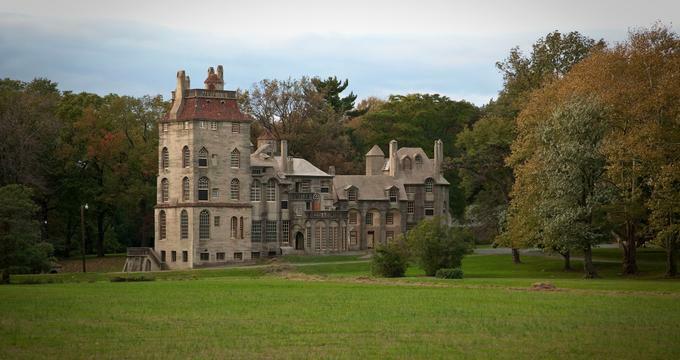 A variety of Bucks County Historical Society public special events are hosted throughout the year at the Mercer Mile facilities, including a Sunday storytelling sessions series for children, an adult crafting workshop series, and a number of holiday home tours and events hosted at the nearby Fonthill Castle facility. The Cocktails at the Castle fall gala also serves as the Society’s annual fundraiser, offering food and cocktails from a variety of local vendors and opportunities to freely explore the castle’s preserved rooms and historical collections.